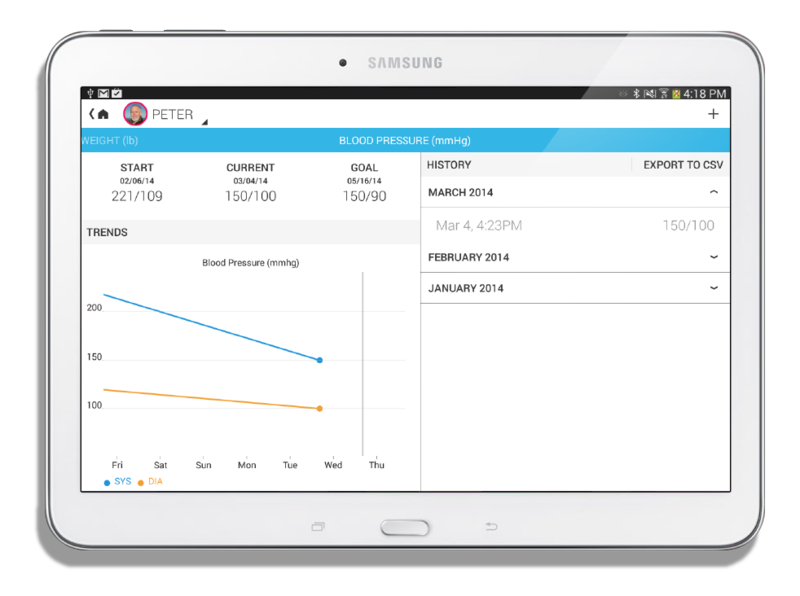 My Health Goals is a platform from Samsung that helps patients with chronic diseases by monitoring conditions, coordinating medical care, connecting social circles, and providing educational resources. The platform consists of a cloud backend, doctors portal, and patient app. I was the lead designer and worked directly with Samsung's CMO (Chief Medical Officer) to translate his vision into a product. The design process included researching medical technologies, understanding healthcare best practices, and interviewing doctors and patients. I owned the product design, creating personas, flow diagrams, wireframes, specifications, and assets, then working with engineering to create a functional MVP. I also presented to various executive teams of hospital associations and at HIMSS 2014 (a leading health IT conference). Create a comprehensive health platform consisting of a patient app to collect data and connect supporters, a doctor's portal to monitor and guide a patients, and a backend to aggregate and interpret patient data. Understand the current context: real patient experience and real medical practices. Identify failures/opportunities and design solutions that work, given the current context. The biggest challenge of this project was internalizing the various medical elements involved. To understand the patients' conditions, we needed to learn about living with chronic diseases. To understand the doctors point of view, we needed to learn how they work with patients and medical protocols. As a technical product, we needed to understand the landscape of medical information technology and hospital systems. To make matters worse, some elements are already in disarray with various players that are reticent, self-interested, anti-competitive, or outright greedy. As product designer, I ran point on much of this research with SME's usually only representing a narrow slice of the overall picture. It was therefore, left to me to distill all this into something that we could then use to design around. I am also disappointed that we never saw real deployment. We created a great product with lots of potential to actually improve the quality of peoples' lives, many of whom are not only suffering from chronic disease but also alienated socially. Unfortunately, in this case good intentions ran aground on the real-world of medical tech. Medical systems like My Health Goals are subject to various government regulations such as privacy requirements and medical device classification, which requires long, costly clinical trials. Moreover, few players in the medical field leads to deeply entrenched relationships, leaving little room for new players, even large ones like Samsung. Dr. Rhew was the product champion and SME, setting the vision and advising on medical issues. I worked directly with Dr. Rhew to design the app, helping achieve his goals, of better patient outcomes through healthcare technology.